After the massive success of Silver Linings Playbook, writer/director David O. Russell returns with American Hustle, a frantic and deliriously unsightly film that has no intention to conform to audience expectations. Russell isn’t one to shy away offbeat, challenging films, as I Heart Huckabees and Three Kings have proven. American Hustle isn’t quite as strange as the former, but it certainly isn’t afraid to let its characters loose on the unsuspecting viewer. Irving Rosenfeld (Christian Bale) and Sydney Prosser (Amy Adams) have got a pretty good thing going. As a couple of grifters, they’ve been posing as money lenders, ripping off anyone who comes their way asking for a loan. When they’re caught by FBI agent Richie DiMasio (Bradley Cooper), they’re forced to use their powers for good in order to avoid jail time. What follows is a chaotic and sometimes confusing series of heists, where no one is trustworthy and everyone is out to screw everyone else. This would be my number one problem with American Hustle: it’s impossible to know where everyone stands. There is not one single sympathetic character, and everyone’s so dishonest that there’s no one to root for. I felt detached for the entire duration, simply watching these reprehensible people lie, cheat and steal their way through the plot. The art direction, costuming and make-up is glorious. It seems the filmmakers intended to show us just how gross fashions were in the late 1970s, with the hair department making the biggest impact. Once more, Bale seems to have transformed his body, with an unsightly pot belly that hideously complements the most ridiculous comb-over you’ve ever seen. The performances are decent, however the film is nothing more than an opportunity for each actor to chew the scenery one at a time. Thus Bale, Adams, Cooper, Jeremy Renner, Jennifer Lawrence, Louis C.K. and Robert De Niro all get a chance to ham it up. The problem is that the film doesn’t really go anywhere. As a heist flick, the pacing’s all wrong, and the denouement feels unsatisfying simply because you’re left wondering what the point of it all was. 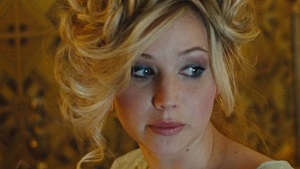 As a comedy, American Hustle is entertaining. It’s often laugh-out-loud funny, even if the narrative lacks purpose. If you enjoyed the zaniness of I Heart Huckabees, then this will probably be down your alley. For everyone else, you may find the badly-paced, uneven storyline a little hard to swallow. This entry was posted in Film Reviews and tagged Comedy, Heist by Stuart Wilson. Bookmark the permalink.